Is Parental Alienation Junk Science or Real? Parental alienation has long been a debate in the family courts. There is a great divide on whether parental alienation syndrome is real or junk science, and whether parental alienation is used by abusers or protectors. Tamra Judge and Lita Ford both have experienced child rejection after going through divorce. Lilia Luciano of ABC10 news explores this highly charged topic. Kathleen Russell of Kathleen Russell Consulting says parental alienation is junk science, “because the family courts are so unregulated PA gets used as a weapon.” She is of the belief that because Parental Alienation Syndrome (PAS) is not in the DSM that it does not exist. Just because something is not in the DSM does not mean it does not exist however, as I will explain. “Identifying replicable patterns of intercorrelations between symptoms, course, and outcome” is how schizophrenia was classified into the DSM, even though schizophrenia remains elusive and a hypothesis. Rather than abandon the idea of schizophrenia clinicians set out to discover what was causing the symptoms, course, and outcome. I am not calling parental alienation schizophrenia, what I am correlating is that parental alienation has specific symptoms, course, and outcome. A boy wrote a letter to his mother telling her that she belonged in a mental institution, that she was nothing to him, that she was nothing but a screw-up, that she was sick, selfish, that he wanted to have nothing to do with her or any of her relatives, and that he hoped she died a horrible, painful death. In other words, this boy disowned his mother with the most aggressive, vile, and hateful language. This is real. And this does not mean the parent did anything wrong at all. It does not mean that they have bipolar disorder either. I know, because it happened to me. My son told me that I was bipolar and needed help and that he wanted nothing to do with me, that I was screwing up his life, and to leave him alone. You can imagine how our telephone conversations went, they didn’t. The conversations I mean. We didn’t have conversations anymore. If he answered the phone it was only to tell me to F*** off and never call him again. He was only 10 years old at the time. His father had put him through a campaign to remove him from my life over several years and he had finally given in. The courts were not putting an end to his father’s campaign so my son did all he had the power to do. If he appeased his father, like the courts had been doing, then he hoped to put an end to the reminders of the pain of thinking about me, and an end to his father’s constant pressure to cut me out. It wasn’t until I learned about parental alienation that I figured out how to frame my case in the family courts and get my children back. If you are going through this, do not ignore it. Learn how to frame your case in your child custody suit. The other parent is using this tactic to defeat you and convince the court that they are the better parent. And in the process they are torturing the children. 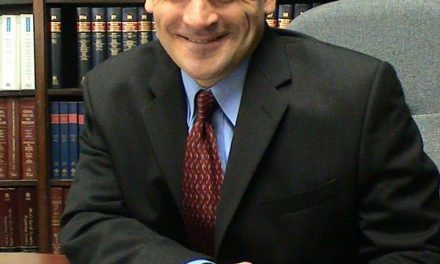 You can visit me at www.fixfamilycourts.com/contact. Let me know what you are going through so we can help you find solutions for how to get your child back after the courts buy into the other parent’s alienating tactics. How you address attacks on your character and your relationship with your child, and how you react are going to make a difference in your case. If you ever want to really be able to exercise your joint custody and protect your child from loss of the benefits of shared parenting, you have to get started now. Parental alienation is a long-term process of interacting events. Not being listed in the DSM-5 does not make it an all or nothing. I get what you are trying to convey Bob Saunders, but those that want to deny that parental alienation exists completely discount that whether or not PA can be described as a manifest clinical syndrome does not invalidate that there is a complex network of interacting events that are leading to specific outcomes. You can watch the interview that Lilia Luciano on ABC 10 and see my responses to this discussion below the video. Lilia aired this segment the day before Parental Alienation Awareness Day, also called Bubbles of Love Day. The outcomes are not good when a parent embarks upon the better parent model when their attorney tells them that this is how to win child custody when they are trying to win joint custody. The children and the parents are all stripped of their fundamental rights, the parent goes broke trying to afford all of the hoops the attorney says are required in order to get enough evidence to show how good they are and how bad the other parent is. This requires extensive discovery, lots of allegations, and getting the child on your side. This harms the child and is a violation of civil rights. The family court process commits constitutional violations that you are not being made aware of which is allowing things like parental alienation to take root. If these pitfalls and fallacies were identified earlier and addressed properly fewer parents would be driven into divorce bankruptcy, more children would be protected, and much of this irreparable harm would be prevented. Kathleen Russell complains about the thousands of dollars being used to fight alienating parents tearing children away from fit and loving parents and complains that the AFCC is teaching about parental alienation. Later Kathleen says that Dr. Childress’ work is not valid because the very industry that he challenges does not like what he teaches. She also says that only 5% of the time are children found to be lying. It seems, from this interview, that Kathleen presumes that whatever the mother and child say should be believed. I wonder what her statistics would be on how often false allegations are made. Any parent that has gone through a custody battle knows that people supporting the current family court practices use labels to discredit to protect the abusive practices that they support. Joe Sweeney is correct that the alienating parent uses tools in the court like domestic violence allegations to gain leverage in the child custody case, and that in family court the standards are lower than in criminal court, so they are able to gain advantage using this method. Most of them are ex parte and the other parent is rarely able to overcome this taint on their reputation and the impression that this made on the judge. Shortly after this statement by Joe, one of the parents commenting on the sidebar asked what about parents who have 50/50 and the other parent is embarking on poisoning the child against the other equal parent and interfering with their parenting time. My response is this: The majority of the time when a parent is trying to turn a child on the other parent (poisoning their mind, brainwashing the child), even in 50/50 situations, they are not happy that they didn’t get the judge to cut the other parent out so they are usually building their case to take back to modify after they get the child on their side to use the child as their tool to get what they didn’t get the first time. Dr. Richard A. Warshak has a wealth of information, books, and studies on parental alienation, J Michael Bone, PhD – Parental Alienation has some easy to understand YouTube videos and is great with teaching your attorney about parental alienation, and Ryan Thomas who was a child of alienation now teaches parents how to navigate their relationship through the parental alienation and have a relationship with their child again. Parents going through this need to try to minimize the harm while continuing to work to re-connect with their child. Regardless of what anyone calls what is happening to you, you know that what is happening is damaging your child and your relationship with that child. I hope that you all find the tools that you need to put an end to the destruction that these family courts are wreaking on you and your family. Understanding what is happening is the first step in succeeding in this battle. The discussion briefly turns to child support and how it is calculated. We have an equal protection argument on child support. If you are interested in learning more about this become a member to read more on that issue. Lilia Luciano then makes a nice transition off of the child support issue, where she acknowledges that there are incentives for people to fight over children even if they are not interested in parenting. My response to her is that I think that a deeper investigation into why some parents walk away would frequently reveal an alienating parent in the mix. I believe that fewer parents would walk away from their child if they were being protected from a parent frustrating their ability to have a relationship with their child and if the process didn’t discriminate against them for choices they made during the marriage. Our book can answer a lot of your questions, it is called, NOT in the Child’s Best Interest. If you are a member, you can read the entire book online here. Kathleen Russell’s response to Lilia’s question of whether a parent can limit another parent after the other parent has not been involved in the child’s life for two years is that “Anytime you step into the courts you open a Pandora’s box” and that usually the parent trying to limit the other parent’s time is usually punished. She talks about how a parent who has no relationship can swoop in and get 50/50 custody. What she doesn’t explain is the reason that this happens with the exception that the absent parent can show that the other parent intentionally cut them out and frustrated their attempts to have that relationship for no valid legal reasons, is that because the courts are operating under lowered standards you get different results all over the board; what normally should be an easy abandonment case turns into a multi-year bankrupting, extremely devastating and stressful process that ultimately ends up harming the child more than the child having both fit and loving parents involved in their lives even with disagreements and differences would have had. Lilia then asks what kinds of systems should we have in place to prevent a good parent from being removed form a child’s life, how likely is that to happen, and also in the case of abuse, what should be in place to prevent them from ending up in the custody of an abuser when they cannot meet the standards set by the court? Joe Sweeney says that we need highly trained experts to diagnose, more oversight, and electronic reporting so that data can be collected to show what is happening in family courts. If you know us, you know that we advocate for less expensive solutions for protecting parents and their children. The first step in protecting children is for parents to learn their constitutional rights and to insist that their attorney protect those. Without those, you will continue to need expensive experts and the court will continue to be a Pandora’s box. You can limit the court to just abuse or a disagreement that the court has legitimate power to assist with, and thereby limit the courts from limiting you and how you parent your child. There needs to be more talk about keeping the courts out of each of these parent’s lives and business. Diagnosing the parents is only necessary after there is damage. If the process was protective of rights from the beginning, there wouldn’t be anything to fight over regarding the child, there would be no incentive to poison the child’s mind, there wouldn’t be any need to diagnose the parents. This would also allow real abuse to surface and be taken seriously. The most important thing all families need to receive proper protection is to protect rights. Hiring highly trained experts is expensive. This process needs to be changed. The family court process is too expensive and is bankrupting families emotionally, physically, and financially. Alienated parents you will need tools to not only help you reconnect with your alienated child, but also to know how to ward off attacks from your children and others. After Tamra Judge came out and told the public that she had been alienated, the alienating parent and alienated child came out with the claims that are frequently made in alienation. I don’t know Tamra Judge or the circumstances in her case or anything about Tamra Judge’s alienated child. I do know that when children are being alienated they can be taught that a parent not cooking meals for them is not feeding them, they can be taught that it was horrible and neglectful for a parent to feed them cereal for dinner, etc. I do not personally know Tamra Judd and cannot say what the details are behind this child’s belief. I can tell you that my children would make the complaint that they had no food in my house when they compared me to their father’s massive barbecues and the fact that he was a more traditional guy who liked to sit down at a dinner table at a set hour in the evening with everyone there and eat formally at a table, whereas I was more informal. Celebrities tend to have crazy schedules and this makes it very easy to paint to a child that any deviation from what one parent chooses is abnormal or abusive. 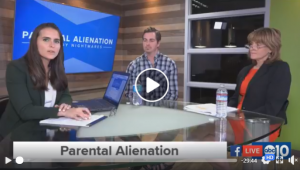 Dr. Steve Miller on Why Courts Fail to Recognize Parental Alienation. Patrick Glynn, and alienated father and advocate shares how Title IV-D impacts parental alienation and helps you to follow the money that incentivizes the courts to empower parental alienation. Want to watch more about the corrupt family court process and how they use children and money to manipulate the results, watch the movie Divorce Corp.
Now you are ready to start learning about how the courts will bully you and try to get you to give in to them and concede your rights. Kristi Beck with Mommy Interrupted interviews Sherry Palmer with Fix Family Courts talks about their system of support and how they empower parents in child custody battles. Hear about how your child loves you for who you are, and how the court’s imposing their idea of the perfect parent harms your child. More from Kristi Beck on Spreaker with Mommy Interrupted. 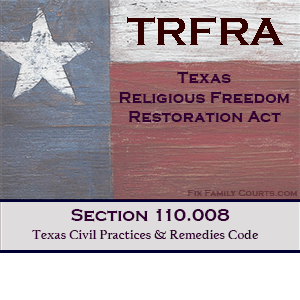 NextNew Appellate Court Opinion that Family Court Violated Constitutional Rights!